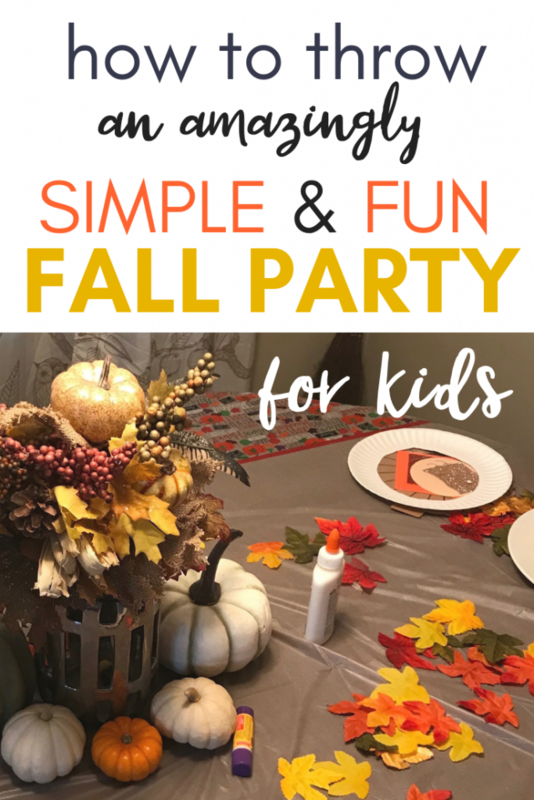 Since moving here in August, I have one friend (a former student/current friend from NY), and I asked if she’d be into getting our kids together for a little fall harvest party. 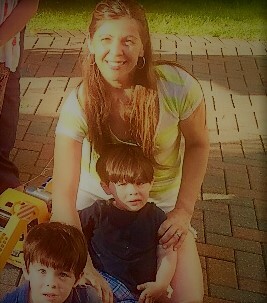 Having 4 kids of her own, she was game to add in my twin boys to her chaos and let the fun begin. A few texts back and forth, and we had ourselves a ‘pumpkin party,’ as my little guys referred to it. The thing about throwing a party for kids is that they are pretty easily pleased. 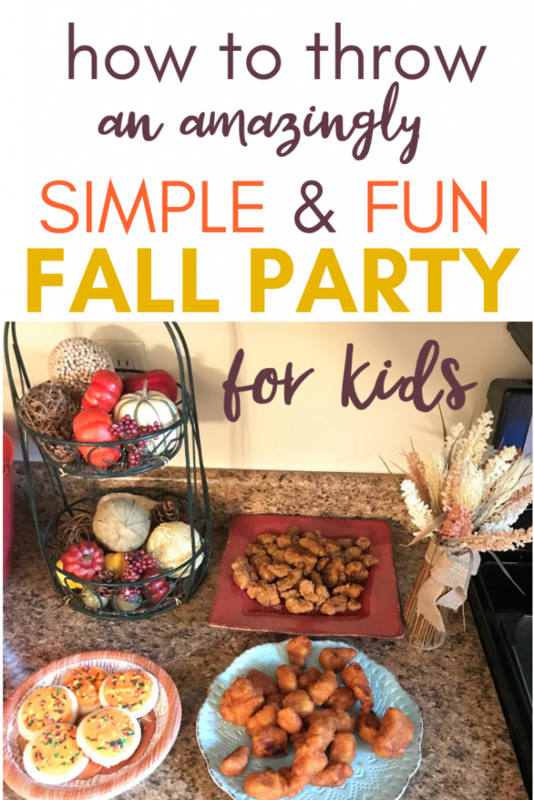 You don’t have to come up with anything fancy or be ‘Pinterest-perfect’ for them to have a great time. Just the novelty of ‘party’ is excitement enough. 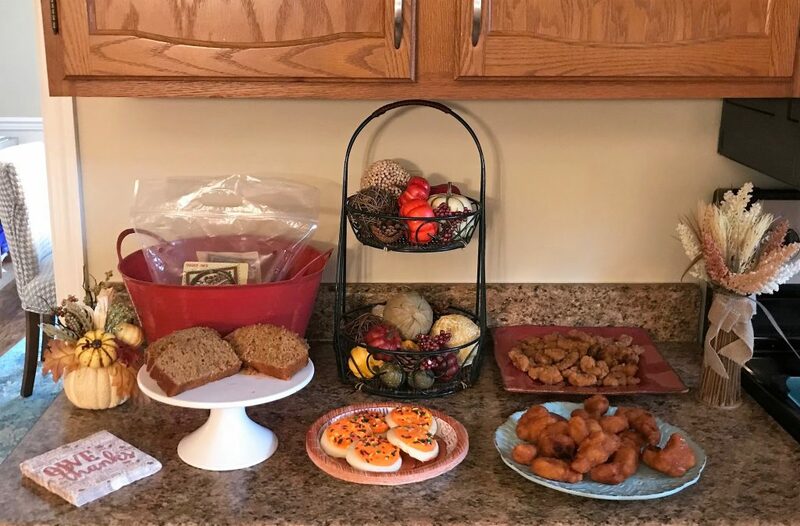 A few crafty activities, a few games, a little food and dessert, and you have yourself a nice little harvest gathering for the tiny people. 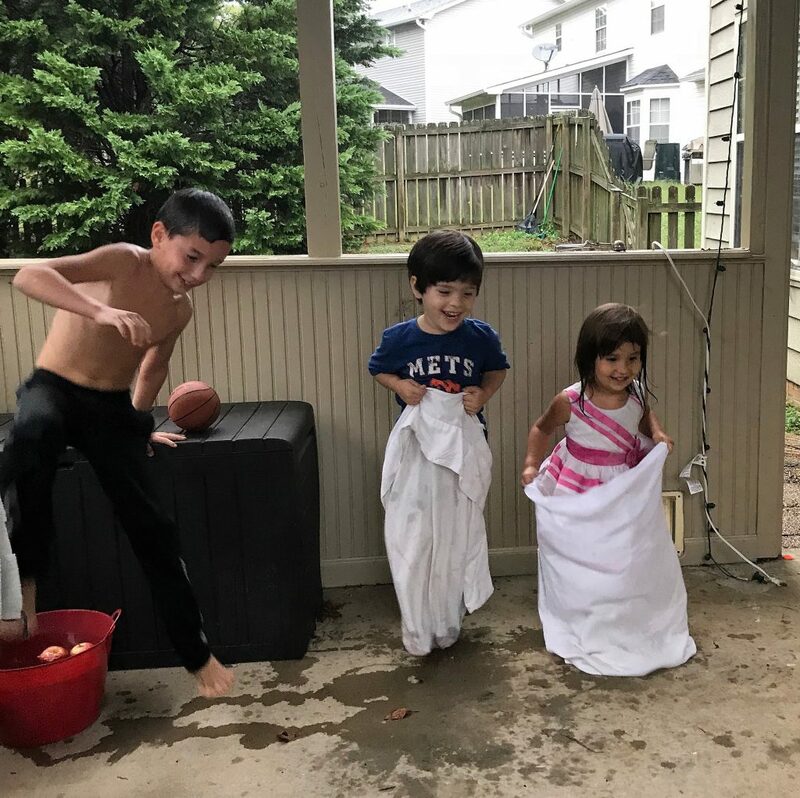 It rained the day of the party, and while I was initially disappointed, it added to a cozier feeling instead of eating pumpkin bread while sweating in 90-degree weather. We had to adapt the agenda a little, but the kids were none the wiser. The plans I’m sharing today will work for an indoor as well as an outdoor party. Neither Tiana nor I had the energy to start making lots of food from scratch, but that was totally OK! 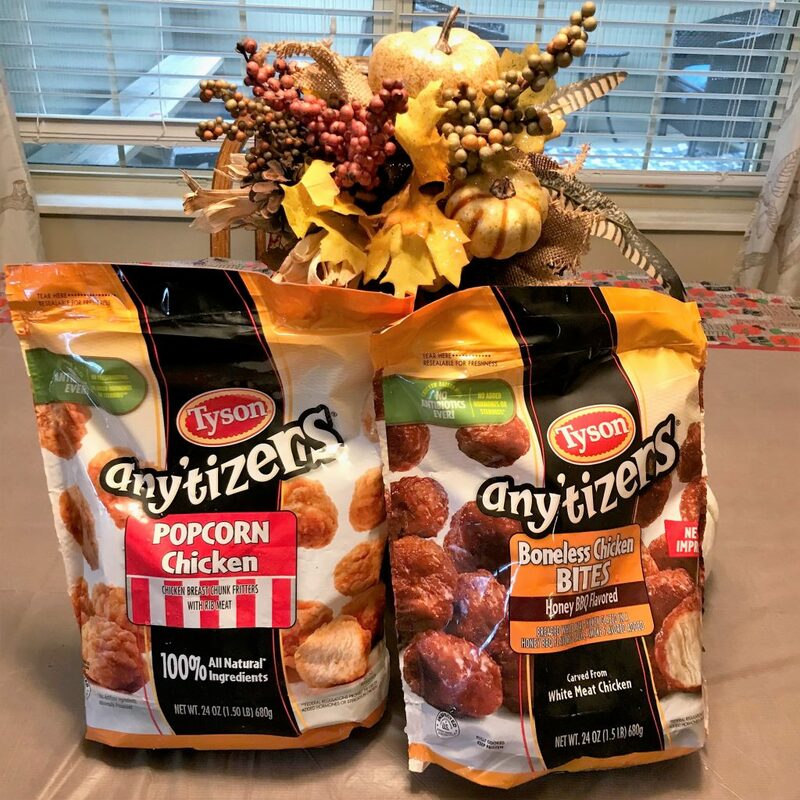 We are not above short-cuts, and Tyson® products came to the rescue! A quick trip to Walmart, and we were good to go. 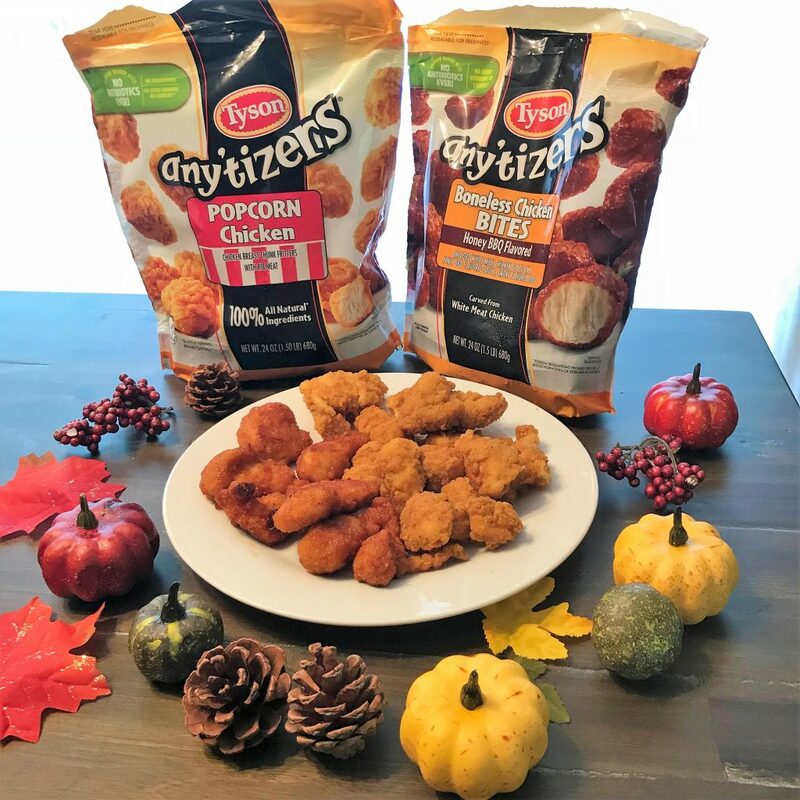 We prepared Tyson® Any’tizers® Boneless Chicken Bites (Honey BBQ Flavored) and Tyson® Any’tizers® Popcorn Chicken – the perfect choice for kids. 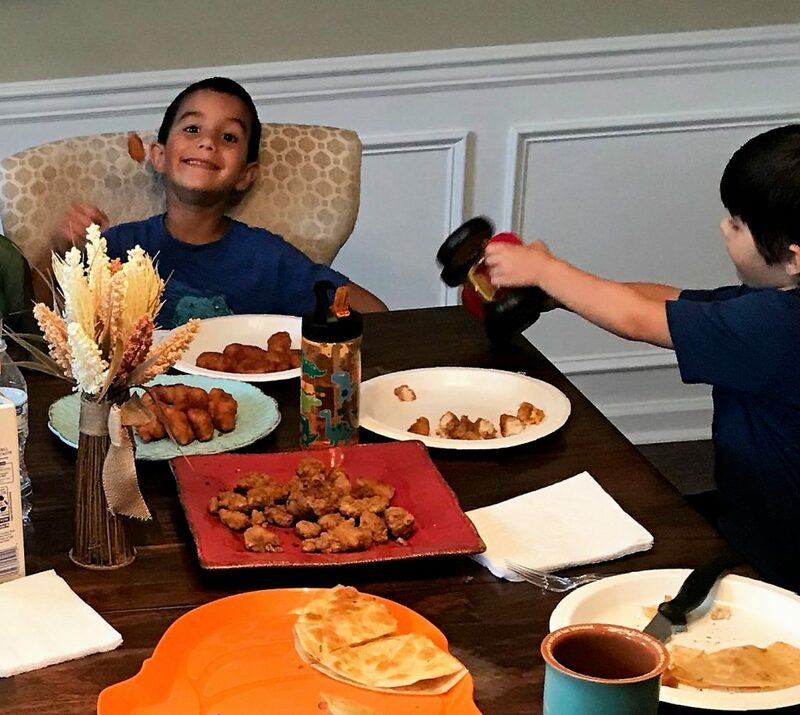 Easy to prepare, quality ingredients, and a thumbs-up from the pickiest among us. 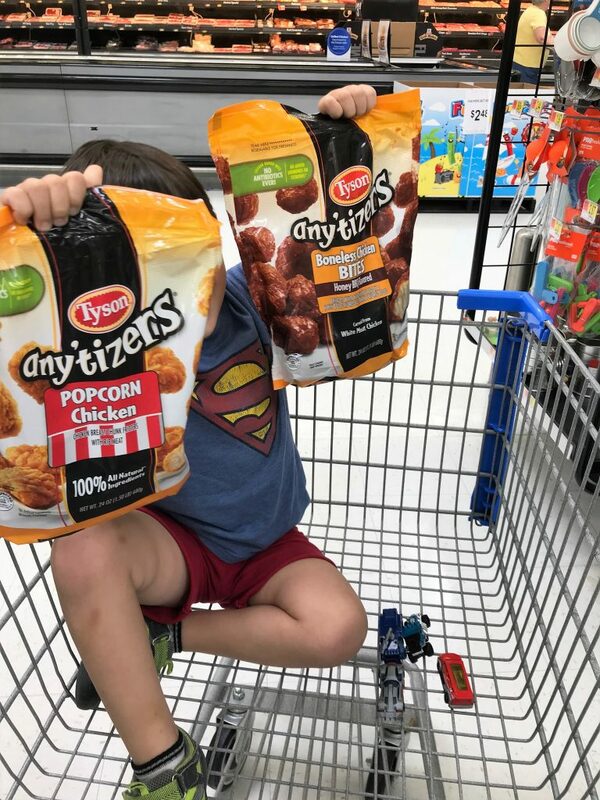 (If you’re planning on lots of adults being present, Tyson® Any’tizers® Boneless Chicken Bites (Buffalo Style) is another great option!) 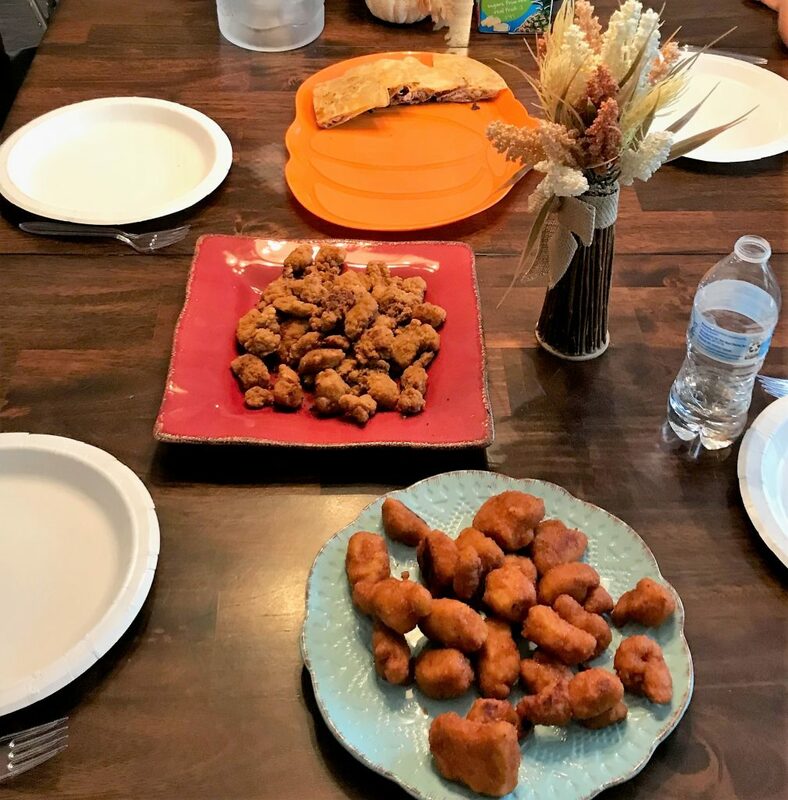 Served with some cheese and chicken-and-cheese quesadillas, it was just the right amount of food for all of us. 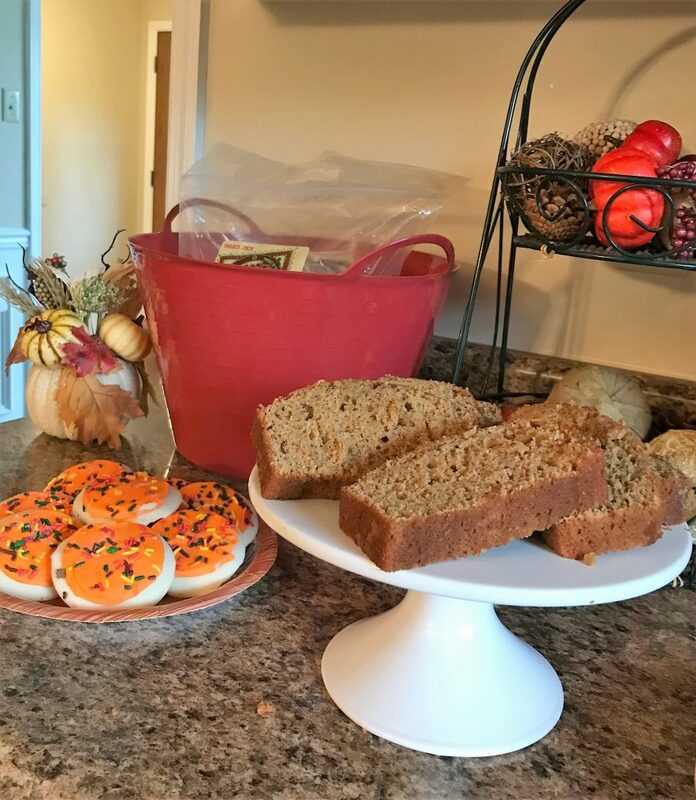 For dessert, we also kept it simple with the fall-themed cookies and pumpkin bread. And for drinks? Apple cider, of course. Simple is the theme here, and luckily, there were quite a few crafts that were easy enough for us non-Martha-Stewart types to put together. 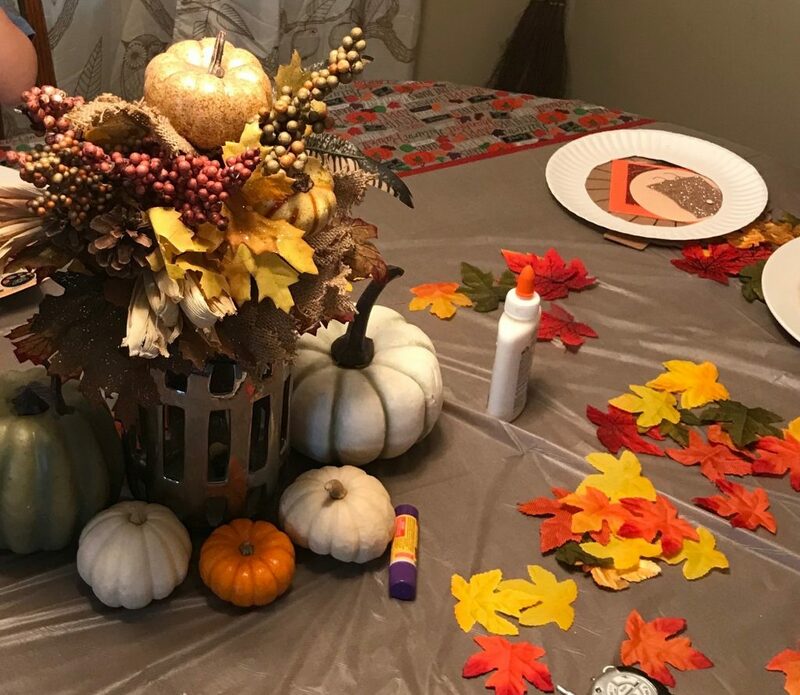 We made a fall leaf wreath with white paper plates and fabric leaves that are available at any store that sells crafts materials. Just cut out the center, add some glue and stick the leaves on. Simple enough for even the toddlers to do. 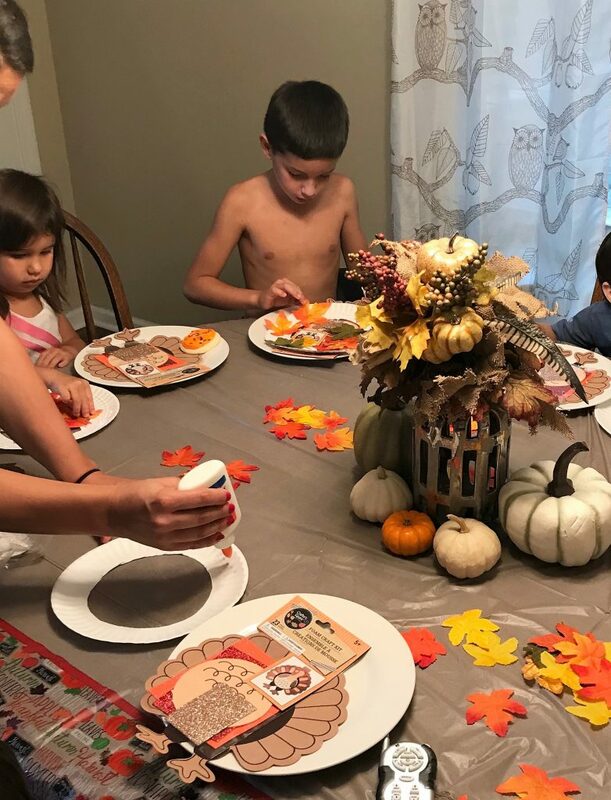 Tiana also found a turkey sticker craft that the kids loved doing as well. Dollar stores are a great place to pick up crafts of this nature! Yes, my boys. And party games. We stuck with the harvest theme for (some of) the games. 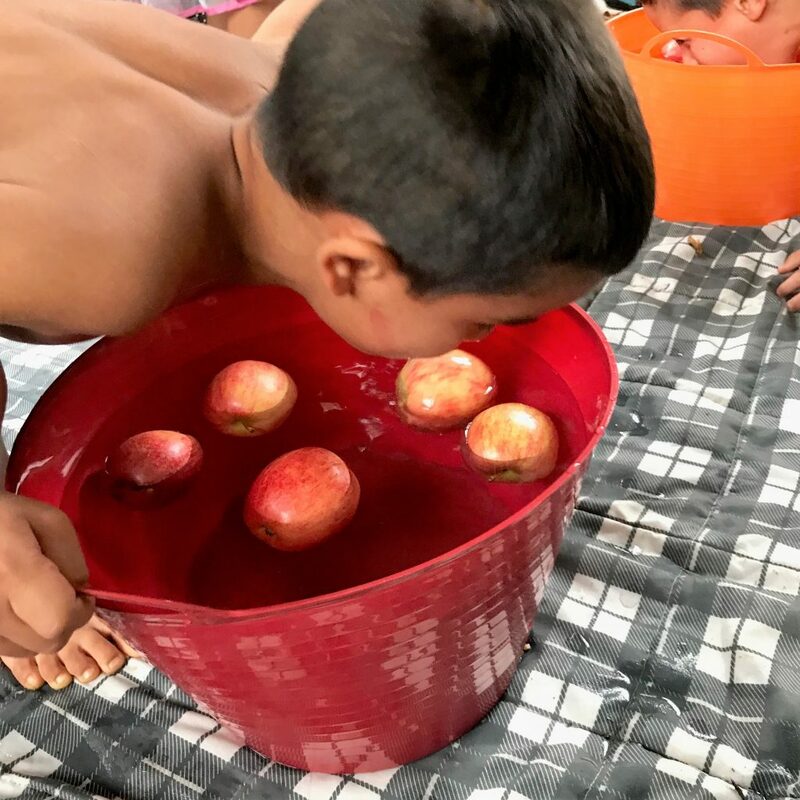 We did bobbing for apples (a little tough for the younger ones who liked to cheat, but the bigger kids had a great time!) and ‘Scarecrow Says’ (a fall version of ‘Simon Says’). 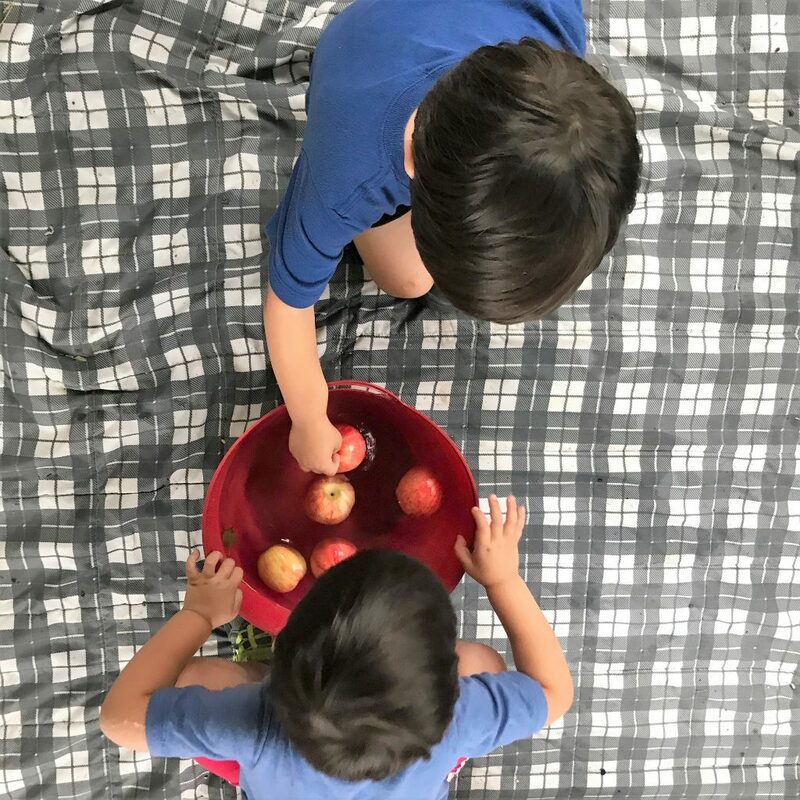 Not necessarily harvest-themed, but we also had sack (pillowcase) races and you can’t go wrong with that oldie but goodie! 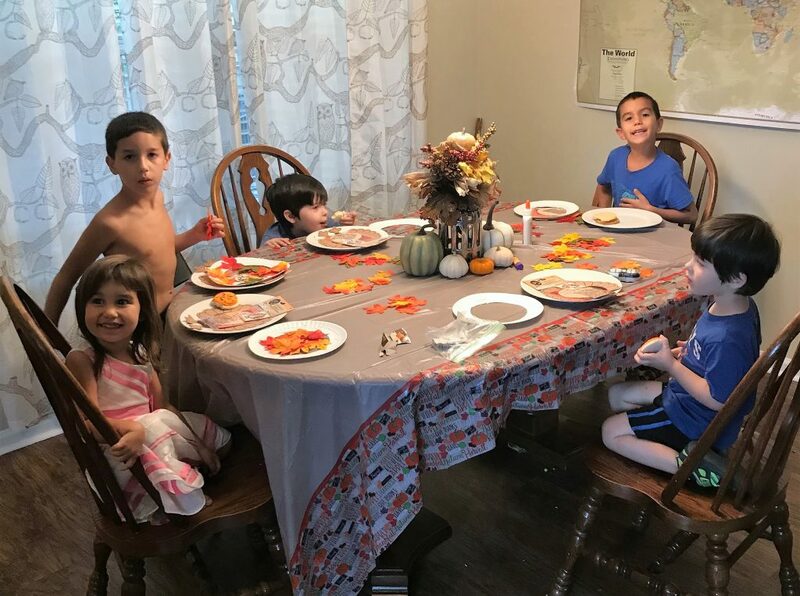 In a world where Pinterest and Instagram rule the day, it’s nice to know that a simple, imperfect gathering can be just as fun (and way less stressful!). Especially when kids are involved, simple is best and imperfect is completely acceptable. 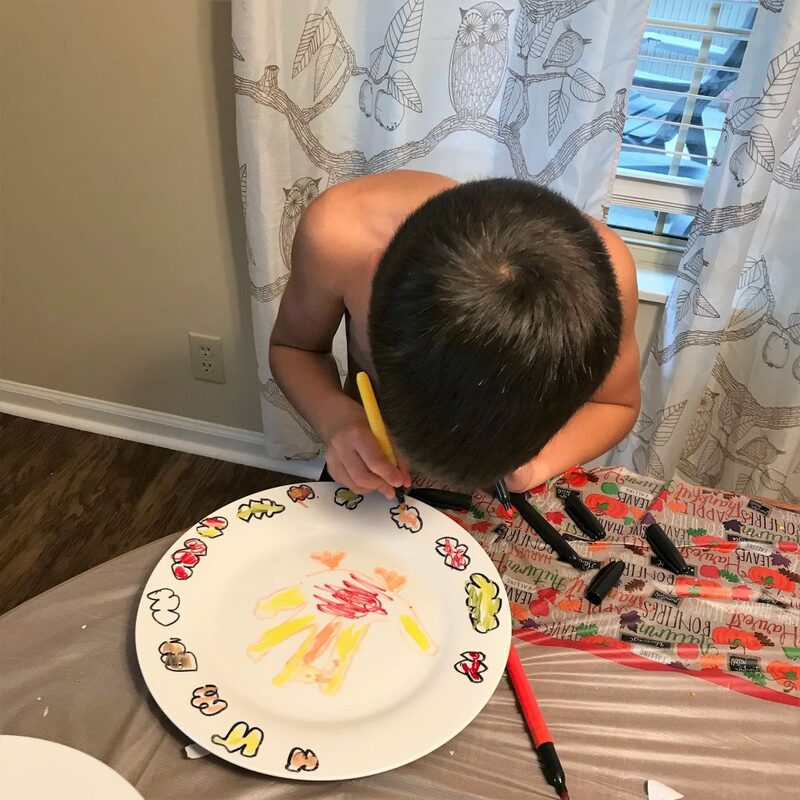 Short-cuts are just fine when you’re a mom on the edge of her sanity, but you’re still making an effort to put together some fun memories and events for your kiddos. And honestly, our energy is better spent having fun with our kids and interacting with them, instead of making sure every detail is perfect. 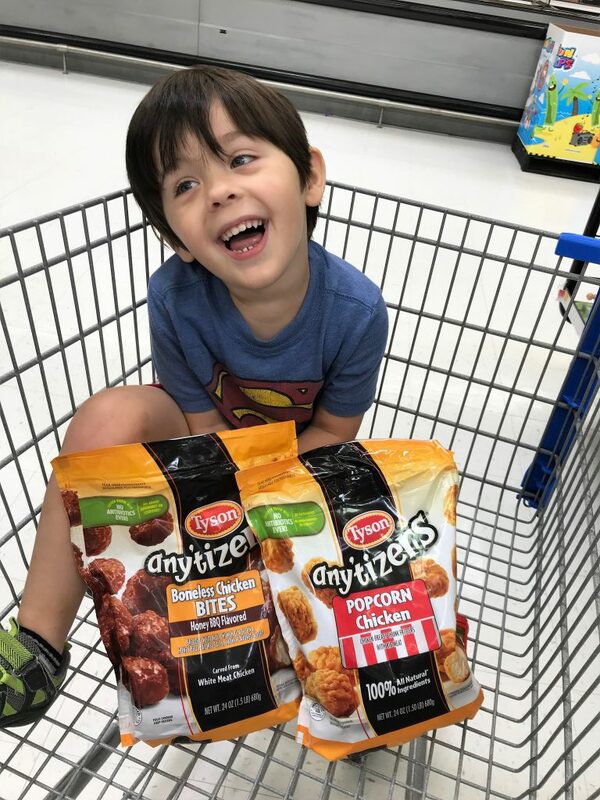 Keeping a simple menu, like serving Tyson® Any’tizers® Snacks, is the way to go and a guaranteed crowdpleaser. 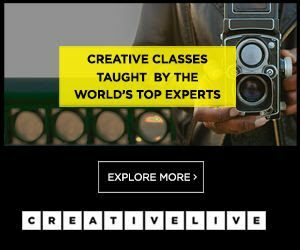 Simple activities and games are just as fun as hip, trendy ones (probably more so). The point is to have a great time with family and friends and create some fantastic memories. And maybe even some traditions. Tiana and I had such a good time doing this with and for our kids, we said we were going to make this a yearly tradition. Rain, heat, whatever East Tennessee throws at us, we’re signed up to give a fall a friendly welcome every year.